[EDITOR’S NOTE: Terri is an accomplished violinist, who performs at various classical concerts in town and also teaches private lessons. She and her husband are wonderful members of the Body of Christ in Colorado Springs, and have served faithfully in a variety of capacities at New Life Downtown. Here we are in the midst of Lent, and I am trying to take time to spend in this season contemplating the meaning of Christ’s death and resurrection. Music is always something that speaks to my heart, but especially in this season I return to music that has ministered to my soul in a meaningful way, that invites me into a deeper place of contemplation. I always find singing the hymn “O Sacred Head Now Wounded” a central moment in a Good Friday service. It conveys a depth of emotion and meaning, the words uniting with the melody and harmony, echoing and guiding the cry of my own heart. After finishing a master’s degree in music, I was given the opportunity to study for one year in Amsterdam, Netherlands. I remember the cold, drizzly grey winter, followed by the emergence of bright tulips perfectly timed with the season of Lent and Easter. 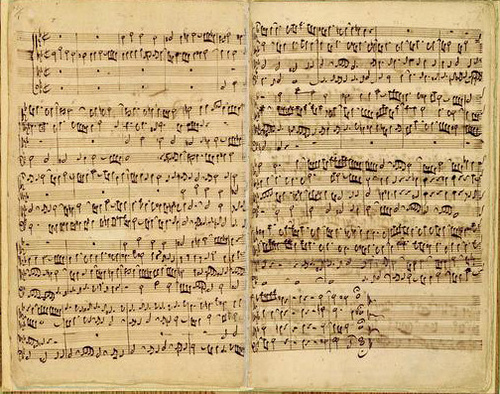 As springtime came, there were special concerts—of Bach’s St. Matthew Passion. It turns out this piece is beloved of the Dutch people, much like Handel’s Messiah is to Americans at Christmas, only more so. I found that if I wanted to, I could hear a performance of the nearly two-and-a-half hour piece every day by traveling to different towns in succession! It was a tremendously meaningful experience for me, both as a musician and as a Christian. My soul rejoiced in the beauty of the message, the words and music so finely crafted and blending together in harmony as my spirit worshiped my Savior. Some folks reading this may be thinking, “I know why we’re not singing Bach in church—it’s hard. Hard to understand, hard to sing, it requires an effort that I just don’t want to put into worship. Classical music seems too formal, too OLD, not for our time. I’d rather sing what’s familiar, simple, and easy.” I know what you mean. Bach’s music takes some work, it challenges me to the core as a musician, it stretches me to the absolute limit mentally and spiritually. No other music exposes my inadequacy, or changes me, like this music. But think. How do we as a church approach the study of Scripture? The Bible is also challenging, a two edged sword dividing the tendons from the joints in our thinking. If we only read Scripture shallowly we will probably have a shallow faith. If we are willing to drink deeply and broadly, we will grow roots deep into its riches. This kind of effort pays us back hugely in growth and maturity. Would we be willing to make the same kind of effort with our worship? The legacy of Bach, his life’s contribution to the church was to give us music deeply rooted in Scriptural truth, involving the entire congregation, and crafted with unsurpassed expertise and beauty. To quote John Gardiner again, “Other composers… have achieved greatness in various ways, but it is Bach…who gives us the voice of God—in human form.”’ What more do we want in a worship leader? So, this Good Friday, since I don’t know anywhere to go to hear a live performance, nor do I expect to hear just one chorale in church, I will set aside a little time to listen to my recording of St. Matthew Passion. I will let Bach help me find the words to sing to Jesus, meditating on all He has done for me, and let my heart pause to join in a worship that spans centuries, languages, and cultures. Would anyone like to join me? Find the album on iTunes HERE. Yes and amen to this post. Just as no minister’s training is complete without a study of great Christian saints and theologians spanning centuries, no worship leader’s or musician’s training is complete without study of this great heritage of classical music, created for the same purpose of congregational worship. Yet many worship leaders today have no training or foundation in classical music, and so do not even have a frame of reference for the depth and greatness of Bach’s music. It is very sad to me that congregations that embrace the rich heritage of liturgical elements, weaving them into contemporary services, do not also fully embrace the rich heritage of this type of music, also weaving classical elements into modern worship. Doing so would, as you so well articulate, bring a depth and beauty that would only enhance modern worship. Glenn, you for posting this. Terri, thank you for composing this. What a thoughtful message to ponder and a challenge to consider in this Lenten season! As a musician, I have always appreciated listening to Bach’s works for the solo violin and cello . . . and I am most grateful for Marcel Grandjany who transcribed many of the solo violin scores for the harp. There is something satisfying and settling in both the orderliness and symmetry of Bach’s music, but do not think that translates into simplicity. Terri acknowledges that Bach’s music challenges musicians to the core and reveals their inadequacies. Rarely does one play a piece through perfectly in the first reading; instead, one must work passages over and over, keeping pace with the disciplined beat of a metronome, practicing until sequences are smooth. It is in the struggle and seemingly mundane repetition that a richer, more meaningful (for the musician, at least) rendering of the music is produced. Are these not timely truths in this Lenten season? –A reminder of the weight of Christ’s journey to and sacrifice upon the cross, that we are but dust or vapor, that living out the message of the cross is a hearty struggle that our Heavenly Father can use to refine us for His kingdom purposes. I’m not sure that I’ve listened to the whole of St. Matthew’s Passion, but as mentioned by the editor, perhaps this is a new exercise to add to one’s journey through the Lenten season–a spiritual discipline of sorts. Terry, thoughtful article. Thank you. I remember singing Bach’s St. Matthew Passion while in the St. Olaf Choir. The University of Colorado/Boulder and Central City Opera are combining for a semi-staged production April 23. Should be amazing. Don’t mean to pick nits, but Bach did not write the melody or the words to “The Passion Chorale” (words: Gerhardt, music: Hassler). Bach simply re-harmonized it and smoothed out the rhythm, which was the style of his day a century or so after the tune was written) Just should be accurate about these things. .Agree with everything she said about it though! Great essay, thanks, and thanks for a thought provoking blog!